The US Air Force’s highly secret robotic space plane continues to circle our planet a year after being launched, with no authoritative version of the shadowy mission purpose presented to public. 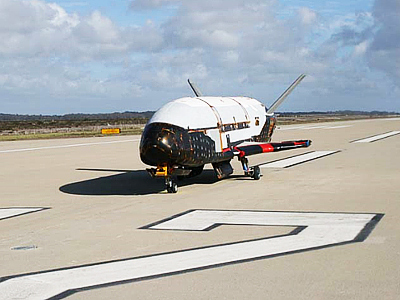 ­Since the original test mission of the first X-37B Orbital Test Vehicle One (OTV-1) that was performed in April 2010 and lasted the promised 270 days, the US Air Force has been insisting the X-37 program is a purely scientific undertaking and a testing platform of new technology. Very little has been revealed about the spacecraft. The only information available on the successive OTV-2 mission launched on March 5, 2011, with an Atlas 5 booster rocket from the Cape Canaveral Air Force Station in Florida is that the space plane is an 8.8-meter- long and 4.5-meter-wide solar-powered vehicle. The experimental spacecraft was supposed to return to an airstrip in California nine months later in December – but that never happened. In the meantime, a third X-37B space plane mission is being prepared with a launch possibly going to be performed before the end of this year. From the very beginning space enthusiasts have been proposing different versions of what the spacecraft is supposed to do while circling the planet at declared orbits varying from 200 to 750 kilometers above the Earth’s surface. The initial idea has been that the spacecraft is a new type of a surveillance satellite that can change orbits to fly above the desired territory on Earth. This version has had a go because the craft did fly over Afghanistan, Iran, Iraq, North Korea and Pakistan and changed orbits not once. There have even been rumors that OTV-2 was spying after unfinished and unmanned Tiangong Chinese space station, past which the craft flashed several times at a nominal orbit speed of 28,200 km/h. 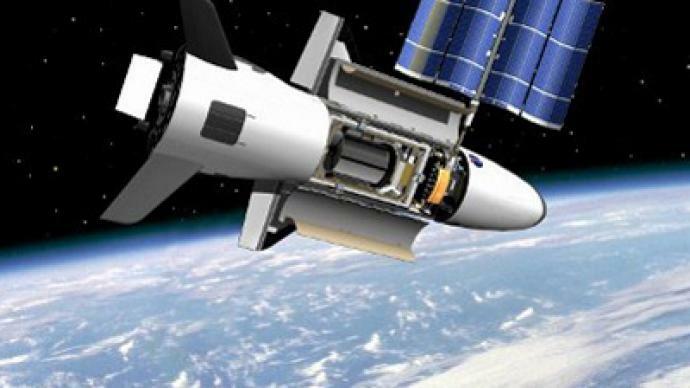 But as Brian Weeden from the Secure World Foundation quite reasonably noted in an interview to BBC, “If the US really wanted to observe Tiangong, it has enough assets to do that without using X-37B." ­Besides main engine, retractable solar cells, avionic equipment, tanks with kerosene-like fuel and hydrogen peroxide the vehicle has an experiment bay for a payload – the size of a pickup truck. Indeed, some spy equipment like cameras and sensors would fit in well, but that bay would be too small for military munitions capable of reaching planet’s surface – provided they have been created and tested. Also, on photos it is quite visible that the vehicle has no docking hatch, so rumors about using X-37B as another means of small-size deliveries to the ISS look groundless. All the abovementioned does not look much for a billion-dollar spacecraft, which probably brings us closer to the answer of what the X-37B really is. Why has the OTV-2 mission been prolonged for unspecified period of time? Possibly because the vehicle has energy and fuel to continue tests and give valuable information to its creators? Maybe this mission resembles NASA’s Mars exploration rover missions Spirit and Opportunity, which were supposed to work for months, but has worked years instead. Boeing, which created the X-37B, must need a showroom that proves it does reliable space vehicles. Particularly after the Obama administration has cut too many space exploration programs, like space shuttle program and the Moon exploration program. Actually, the Obama administration's 2013-2017 budget cuts provide elimination of the office that managed the development of the X-37′s. And Boeing is preparing to shut down its "Building 31″ facility in California, where the X-37s were assembled, too. Back in October 2011, Boeing’s program manager Art Grantz made an attempt to save the project, proposing to build an enlarged X-37C manned model to fill the gap left by retired NASA Space Shuttle program. However, no further developments were reported. After President Barack Obama canceled the Constellation human spaceflight program within NASA in 2011, the development of new space vehicles in the US on the state level apparently narrowed to the X-37. In given conditions of austerity measures in the American space program, the Boeing scientists may have just opted to make the X-37B orbit the globe for as long as possible. While the vehicle is in orbit – it brings data to the scientists. 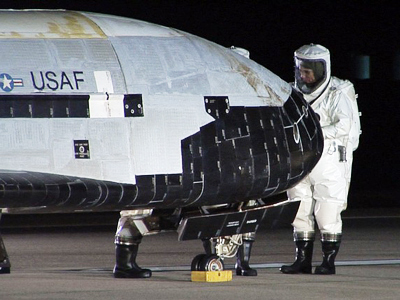 Whether the X-37B was supposed to be a predecessor of the new American human spaceflight program or not, making another step forward means paying a lot for being on the hi-tech frontier of the space exploration. And with given the budget cuts, that is obviously not the objective of the current administration. ­Because the X-37B is an Air Force project, they must be looking for some “military possibilities” of a ship of that kind, associate professor at Frostburg State University William Anderson told RT. “The truth is NASA is long ago militarized,” he said. “Militarily speaking they are always on the lookout for more super weapons to keep the US Air Force on top,” assumed Anderson, stressing that since the project belongs to the Air Force, it must have some military applications. William Anderson pointed out that the military constituent prevail in the US space program these days, particularly after the closure of certain projects dealing with scientific space exploration.